Well suited to outdoor, nature, and sports photographers, the FUJIFILM XF 100-400mm f/4.5-5.6 R LM OIS WR Lens with Circular Polarizer Filter Kit from B&H bundles the versatile telephoto zoom with a 77mm circular polarizer filter. 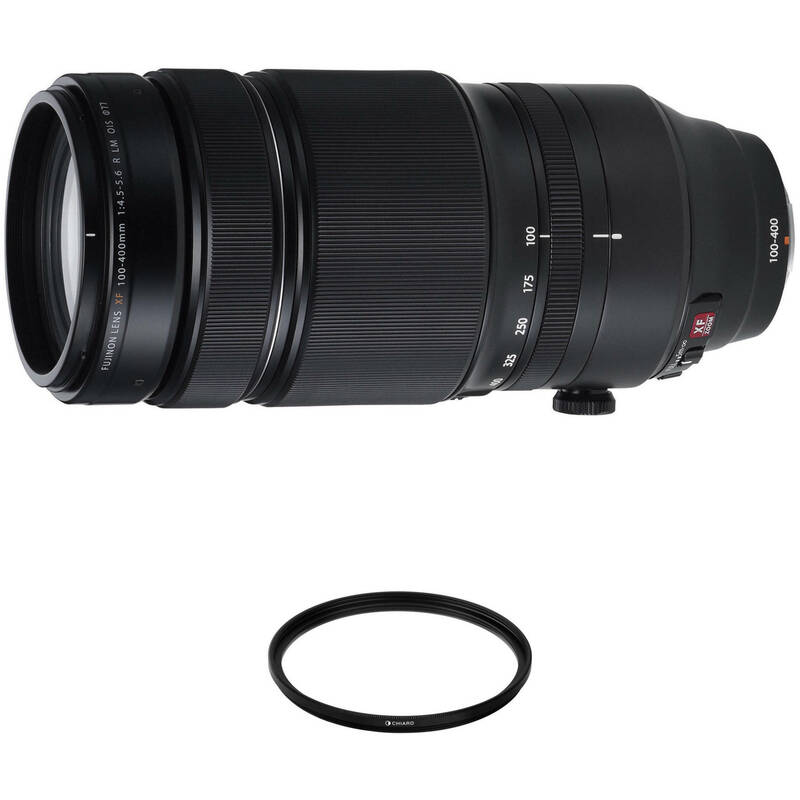 Long-reaching telephoto zoom is designed for APS-C-format FUJIFILM X-mount mirrorless cameras and offers a 152-609mm equivalent focal length range. Twin linear motors deliver quick, quiet, and smooth autofocus performance that is especially beneficial when working with fast-moving subjects. A focus limiter switch on the side of the lens barrel lets you constrain the focusing range to either the full range of 5.7' to infinity, or from 16.4' to infinity for faster focusing performance with distant subjects. The lens body incorporates 13 distinct weather seals in 12 locations to protect against dust and moisture, and to enable worry-free use in inclement conditions and freezing temperatures as low as 14°F. Additionally, a fluorine coating has been applied to the front lens element to guard against smudging, moisture, and dust. XF 100-400mm f/4.5-5.6 R LM OIS WR Lens with Circular Polarizer Filter Kit is rated 4.7 out of 5 by 97. Rated 5 out of 5 by Laura from Loving this Fujifilm lens! Let me start by saying that I mainly photograph wildlife including birds in flight. I had been wanting to switch to the Fujifilm mirrorless system but kept doubting that this lens on the X-T2 would compare to my Canon birding setup. I did a lot of research and it seemed that once I learned all of the AF focus settings and which ones worked best for me, it would work fine. I planned going to hold on to my Canon setup for birding only for 3-6 months...but after a week in the field with the 100-400mm + 1.4TC on my X-T2 I was ready to sell my Canon. It's lighter and quite fast focusing even when using with the TC. Super happy with my decision! Rated 5 out of 5 by MA from Great Lens - Equals SONY a7II w Tamron 150-600 Just got this Fuji 100-400. Put it on my Fuji X-T1. I have test shots I do with all my gear. Houses about 0.8 mile away across river. And compare to other shot of contrasty sand, water, dark vegetation on island about 200 meters. Often with birds on sand. After updating firmware, the 100/400 on X-T1 was at least equal to SONY A7II with Tamron 150-600. Both RAW and JPEG. Fuji pulled better JPEGS on some shots. Tamron is a bear to handle in the wind. Fuji 100-400 on X-T1 barely noticed the wind. I am very, very happy. I travel all the time and I just found a new long-shot travel combo in the Fuji. SONY A7II will max out at 70-200. Rated 4 out of 5 by Aurora from Not quick to focus. I am satisfied with the overall quality of my Fujifilm XF 100-400 lens. It is, however, not quick to focus on auto focus so that subjects that change position quickly, like birds, can be a challenge. I hand hold my camera rather than use a tripod and still manage to get pretty sharp images. I am pleased with the sharpness when the lens manages to focus properly. I compared my Fuji mirrorless system with a photo companion's full frame system and the Fujifilm mirrorless system is definitely as good. My lens at the 400mm focal length took as good an image as the full frame 400 mm lens. Just wished the auto focus accurately targeted the subject faster. Rated 5 out of 5 by ChrisM from Superb lens I'm very glad I bought this XF 100-400 lens for my Fuji X-Pro2. It's sharp, relatively easy to hand hold, and is very sharp. The OIS feature really does allow you to hand hold at shutter speeds where you'd normally want to use a monopod or tripod. The zoom ring is somewhat firm, so you do have to exert some pressure, but that beats having your zoom setting suddenly slide because it's loose. The 1.4x Teleconverter Kit is excellent, too. I'm tempted to buy the 2x Teleconverter based on this setup. I'm looking forward to some bird photography late summer with this lens (I have a Nikon D810 plus the 200-500 and 80-400, which are heavier than this combo). Rated 5 out of 5 by Rich from Wow! Just received this lens today. By the time I got home from work to test it out it was getting dark and was cloudy. Set my x-pro 2 to 3200 asa and shot some test shots hand held with the lens wide open. I thought to myself these will be little blurry as the shutter speed was around 160 . I was blown away how sharp the images were!! Lens is quiet and focuses very fast and accurate on the x pro 2. I also shoot Canon and have a lot of L glass. MY favorite Canon zoom is 70-200L and this lens is much sharper and lighter(or at least better balanced) than my Canon. I will probably be selling my Canon gear as I am thrilled with my Fuji X pro 2 and new lens. Next I will have to test it with action shots. Rated 5 out of 5 by Tdonaldp from No wonder its Fuji I have had to go lighter with my equipment due to paralysis and left the Nikon word for Fuji. I compared the results I get with the Nikon 810 with the 200-500 mm lens with the Fuji XT2 and the 100-400mm lens. I had trouble telling which camera took which picture. Picture subject consisted of herons and egrets that were about 100 feet away from me. Feather detail etc was sharp in both cases. I will admit the D810 had a slight edge in detail i.e. 24 vs 36 megapixels-- but when pixel difference was balanced out - no real difference. Perhaps it is my prejudice but I liked the color detail of the Fuji more - there was a cleaner color/tone definition. It is an excellent lens - PS I also used the 2extender with it - produced great results. Rated 5 out of 5 by Charles from Huge price. Huge range. Huge weight. Killer OIS. Being on the viewfinder end of an APS-C sporting a 600mm equivalent end of range can be dizzying in handheld, especially when carrying a 2lb+ lens. I truly have no idea how the pro birder photogs do it. But what I got this beast for is for pics to flatten out the landscape perspective (picture attached to show what I mean)., and in that regard this lens is utterly superb. Also, I shot handheld 95% of the time, and that OIS made the aforementioned virtual 150mm-600mm view very easy to frame This is a wonderful specialty lens and if you're a big guy like me, the weight is no issue. Rated 5 out of 5 by Mike from Exactly what I needed Was heading out for a wildlife photo trip and the lens arrived just in time. The range of 100-400 allowed for the right capture at the right time. Sharp as expected from Fuji. Focus was responsive and hit most of the time (always a challenge in the woods with lots of items to interfere) Balanced and was comfortable to hold and carry for 3 full days. Weather sealing came into play with light rain for a day. Image stabilization worked as advertised. Very happy with the lens. Did not try the 1.4X with it on this trip. Plan to try it out when appropriate. What is the filter size? Specs on the Fuji web site indicate that it is 77mm but photos of the lens show 82mm. The filter size is 77 mm. Is their a difference of image quality between using the 1.4 extender or the 2x extender.? Also how much light loss in each extender? Using the 1.4x teleconverter with this lens would reduce the maximum aperture by nearly 1 1/2 stops. With the 2x teleconverter, you would lose 2 stops. The image quality would be better on the 1.4x teleconverter as you would lose less light. Does the lens come with a tripod collar? Any recommendations for a case with a shoulder strap, to hold only this lens? Yes, it comes with a lens hood. It would be the Fuji lens, IMHO. I had the Tamron lens for awhile, using it on a 7DMkII and I found the images soft. If you want the reach with the 6D, try the Canon 100-400 f/4.5-5.6 II with a 1.4x tc. When you pick up this lens, does it make rattling noise like the 50-140 F2.8 would? I haven't noticed any noise from mine. Two questions: 1. What does this combination weigh? 2. How does it compare to the Panasonic-Leica 100-400mm zoom in weight?